This is the first scholarly study of the Royal Navy during the reigns of Charles II and James II. Historians have long viewed the Restoration Navy through the eyes of Samuel Pepys, the greatest diarist and naval administrator of the age. Perceptive and intelligent as Pepys was, he presented only a one-sided view of the Navy, that of a bureaucrat attempting to reorganize it. 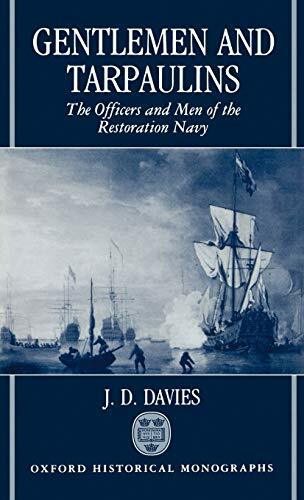 J. D. Davies assesses this traditional picture of the Restoration Navy in the light of recent scholarship, using the evidence not only of Pepys but of his contemporaries. He examines the reactions of naval personnel to the demands imposed by Pepys, and analyses the structure of the service. He also explores the lives and attitudes of the men (the `tarpaulins') and their officers - the quests for promotion, enrichment, and glory; the very different problems posed by peace and war; the nature of life at sea; and the role of the Navy in national life. Gentlemen and Tarpaulins provides a fascinating glimpse into the history of the Royal Navy.